Snurfers—the boards that gave birth to snowboarding—are back, and they are just as much fun today as they were when introduced in the 1960s. On any journey, the first thing we pack is ourselves—and our ideas. Stratton Mountain has a history of helping to turn novel snow-riding ideas into globally revered inventions. 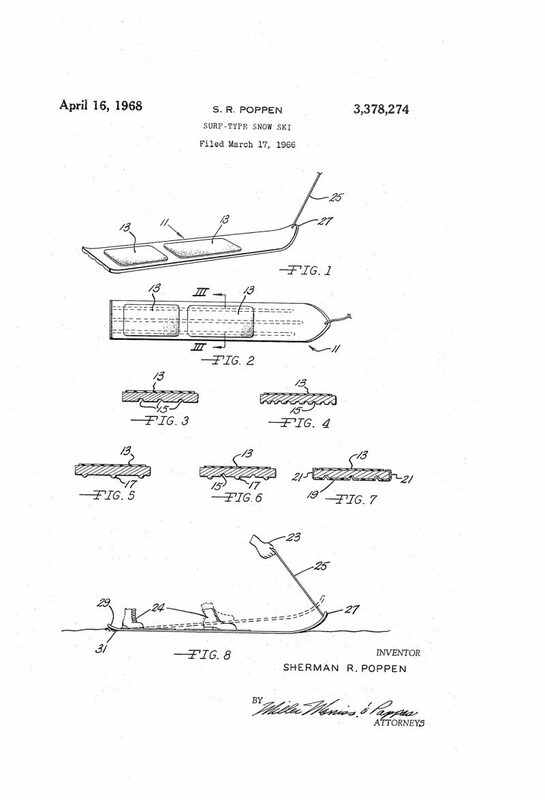 This legacy began with Sherman Poppen, a native of Muskegon, MI, who invented the Snurfer on Christmas 1965. Snurfer (a term invented by Poppen’s wife, as it resembled surfing on snow) surely inspired what became the snowboarding sensation born on Stratton. Renaissance-man Poppen’s “toy,” as he labeled it, was the first to market and laid the groundwork for snowboarding when he bound two children’s snow skis together so his young daughters could ride the snowed-over sand dunes behind the family’s house. The contraption was honed with a rope and other design features. Today, the Snurfer and its initial design drawings are showcased in Washington, DC’s Smithsonian Institution. But, ultimately, the snowboard trail leads to and remains at home on Stratton Mountain, where it’s no secret that Jake Burton modified the Snurfer and helped launch the modern snowboarding phenomenon in the 1980s. Burton had been testing his eponymous snowboards under the cloak of darkness on Stratton’s trails. He took his prototypes to the operations vice president who had ski patrol take them for a spin; in 1983, Stratton became the first major resort to welcome snowboarding. But Jake Burton wasn’t the only innovator on the Stratton scene. Inventor Brew “Vew” Moscarello, an early pioneer of snowboard instruction at Stratton, made personal connections with two snow-surfing gurus who changed his life—and yours. Brew recognized the need to teach students balance before getting on snow, so he dusted off his old Bongo Board that he used to practice snowboarding and began improving on its dated design. This process inspired him to reach out to the original inventor Stanley Washburn (a frequent skier at Stratton), who was then in his 80s. Brew and Stanley developed a bond that led to Stanley giving Brew his blessings to evolve the concept of balance boarding into the 1990s and beyond. As a lifelong snowboarder, Brew wanted a balance board that could turn, spin, rotate, and ollie. So it was off to his “woodshop” to create what is now known worldwide as a Vew-Do balance board. Brew, a former Burton sales rep, founded Balance Designs Inc. (BDI) in 1990 in Manchester, Vermont. The launch pad of modern balance-board training, with a scope reaching far beyond snowboarding, started in the basement of an old restaurant in Manchester where Brew crafted a rock (the roller that the board rides on) and board from logs borrowed from a neighbor’s wood pile. After briefly moving “production” into an abandoned chicken coop, Brew patented the world’s first multi-directional balance board in 1992, having added a taper to the roller rock that the board sat upon. He has been transforming performance balance board manufacturing, riding, and training ever since—and he’s also a helluva nice guy. I bought my daughter Bella a Vew-Do Butter NUB Balance Board and she’s been tearing up the living room ever since. Brew went back to the basics, once again, by developing a relationship with the aforementioned Poppen, similar to how his friendship developed with Stanley, to reinvent and resurrect the Snurfer in a way that continues to please and pay homage to the Grandfather of the Snowboard. Brew’s reintroduction of a redesigned but still classic Snurfer was not an overnight decision. The Snurfer board is recognized as the predecessor to all snowboards, and in 2013, determined to keep the iconic Snurfer brand true to its roots, BDI applied for the intellectual property rights to the brand, and production began for the first time in 25 years. All BDI products are made in the USA using naturally sustainable hardwoods. Brand recognition continues to grow, with converts including former Vermont governor Howard Dean, MTV’s Beach House, and both the NFL and NHL. Vew- Do Performance Balance Boards are sold both online as well as through a network of dealers worldwide. Also under Brew’s guidance, the Snurfer brand has expanded to six models and was promoted with a 50th anniversary party at the Snow Sports Industries America tradeshow. He obviously has a knack for receiving the blessing of the original snow-sport inventor hall-of-famers and taking their dreams full circle, Vermont style. Several factors contribute to why snurfing is so much darn fun, and how it’s an entirely different experience from snowboarding. 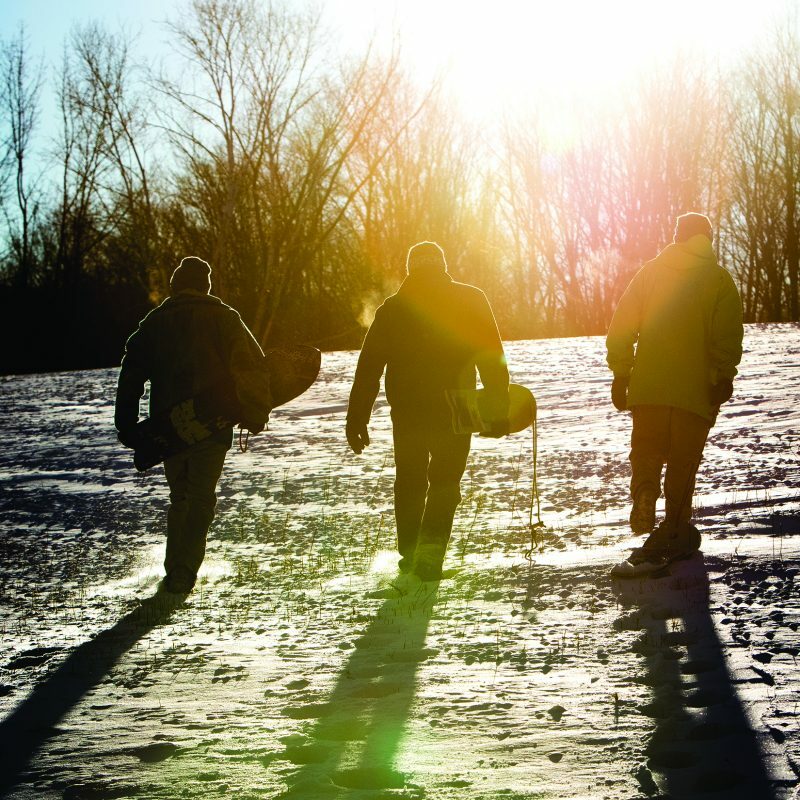 Snurfers don’t have bindings or edges, so you literally surf on snow. The rope helps steer and control the board, as lifting the nose allows the tail of the board to sink into powder, which can act as a brake in deep snow. 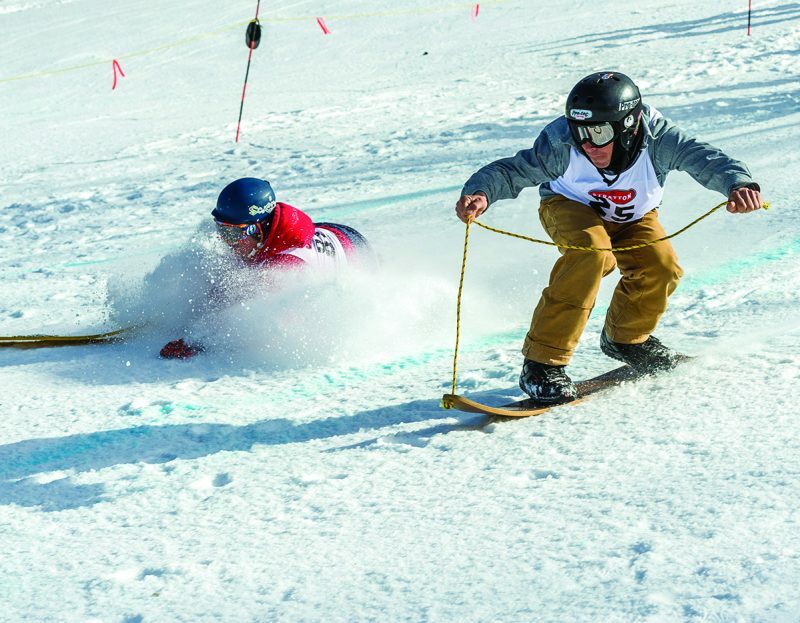 You can achieve speeds similar to snowboards or go even faster (but that might not be the best idea). But speed is not the point. Freedom is a word used by many aficionados who are a combination of revivalists who dusted off their Snurfers 30 years later and equally thrilled newcomers. Being a newcomer is easy, as you make one very low-cost investment—either the powder series, backyard series, or the classic series, which are near exact replicas of the original—that can be used by nearly anyone. And, you don’t need to buy a lift ticket, as all snurfing is accomplished by hiking; very little pitch, hill, or snow is required.